Posted on February 6, 2014 February 19, 2014 by Melinda Pregont, D.C.
Everything you think you know about fats is probably wrong… so forget what you thought you knew! For so long we’ve been told that fats are bad, that they cause heart disease, and that they make us fat. In reality, most fats are good for you, decrease your risk of heart disease and will help trim the waist! As most of us correctly know, some fats are better than others. What a lot of us don’t know is that many of the “fatty” foods that we have been told NOT to eat are actually nutritious and essential to bodily health. Fats are vital in the making of vitamins A, D, E, and K, all of which are necessary for maintaining healthy skin, promoting proper eyesight, brain development in babies and children. In fact, our brains are 65% fat! When it comes to losing weight, fats help us reach satiety, meaning you actually feel full when you’ve had your fill. They can also help curb those overpowering cravings! A trick that really helped me to stop the sugar cravings was to eat a handful of tree nuts, such as almonds, cashews, macadamia, and pistachios. They are a filling snack and after eating them, I didn’t crave the sugar anymore! Not shown on the “Fat Facts:” chart above are the dreaded trans fats. If listed, they would be labeled “bad for you”. These are the fast, deep fried, guilty pleasure foods that should be avoided, such as potato chips, donuts, french fries, just to name a few. These are the fats that lead to heart disease and obesity. Saturated fats seem to get a bad rap when it comes to nutrition, but there are actually some saturated fats that are fine to eat in moderation. 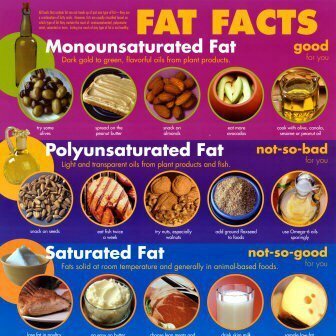 When it comes to saturated fats, you must look at the source (see “Which to Eat” diagram to the right). Just like in humans, animals store toxins in their fats. Thus, animals raised commercially, those given steroids and antibiotics, will store these toxins in their fats, making them less healthy than the animal fats of grass-fed, organically raised animals. If the meat you eat is grass-fed and/or organic, there is not much to be concerned about when eating the animal fat. To sum this up, do not fear fats! They are an essential part of a healthy diet as humans and necessary for good health. Always know the source and try to keep your fats of choice clean, unprocessed and free of steroids or antibiotics. Following these guidelines should help you choose wisely when it comes to fats. Good luck and remember, DON’T FEAR THE FATS! Next week, I will be expanding on this fat topic and talking about how to make your calories count when it comes to healthy eating! Below are links to give you more information on good and bad fats. Previous PostPrevious Is Sitting the New Smoking?